Diffing, what does this mean? Unless you live in Ireland you may not of heard of Diffing before. I use to think it was what the Irish called drifting but no it goes much deeper then that. What is a Differ? A differ is usually a youth, a lad or ladette with a RWD car of some sorts. They are either looked up to by some or hated by many! Diffing is just a different name for donutting in your car. 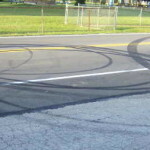 In other parts of the world Diffing is called donuts or donutting, where a driver with a RWD rear wheel drive or sometimes 4WD car will usually from a standstill, will rev the engine hard and let the clutch fly out overpowering the traction from the tyres, then while balancing the steering and throttle, the car will go round and round in circles smoking up the tyres. 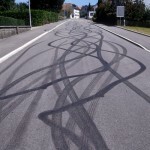 Diffing or Donutting is a basic skill that drifters learn before moving on to actual drifting. Diffing in Ireland has over a number of years become a bit of an underground culture. 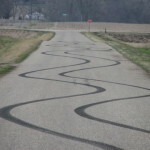 When driving or touring around Ireland you will often come across roads that have tyres marks often going around in circles or going along a road from side to side or circular patterns going a long the road. It is like a form of graffiti……Road Graffiti!. Some roads will have a few marks but some will have lots of very dark tyre marks where a group of differs have gathered and covered the road with tyre rubber. Differs are often very organised, meeting at certain places and at times blocking sections of roads of with spotters, looking out for the Police or Garda as they are called in Ireland. The spotters usually have big cb aerials on there car so they can contact their mates to warn them of police. You can easily spot the Differ during the day, they will have a lowered car, drive with there fog lights on, coloured bulbs in their lights and most have some form of writing on a sun visor strip, usually covering nearly half the windscreen & the spotters with the big CB aerial on their car. Police or Gardaí have been cracking down on the differs the past few years and they impounded a number of modified cars this year as well as some arrests. GARDAI have confirmed that two men were arrested for alleged ‘diffing’ in broad daylight last weekend outside Letterkenny Courthouse, and in the middle of the town’s busiest junction. The men, one from the North and one from the South, were arrested and charged with dangerous driving after a number of incidents during the Donegal Rally on Saturday outside Gallagher’s Hotel. The latest incident comes one year after a young man immediately became an internet sensation after a video of him performing the dangerous manoeuvre at the same spot was posted on Facebook. The most popular car seems to be the Lexus is200, e36 BMW, Toyota Corrola AE86s and Vauxhall Carltons. There are some Organised Diffing event but still some prefer to diff on the public roads. Here is an organised diffing event at Letterkenny Activity Centre in Donegal, put on in May 2015 during the Donegal Rally. Last years event at Letterkenny, this is a yearly event that is put on each year when the Donegal Rally is on. Have a listen to the audio links below, Locals complaining about Differs on Donegal’s local radio station Highland Radio, when the Donegal Rally was on in 2014. Click play below to listen! This entry was posted in Drift Mix, Non Drift News, Unusual Drifting and tagged differs, diffing, donegal, drifting by T Dirte`. Bookmark the permalink.